We, as a community, have neglected our Jeffco Schools for some time, and by extension, our children and educators. The last major investment the community made in our schools occurred in 2004. 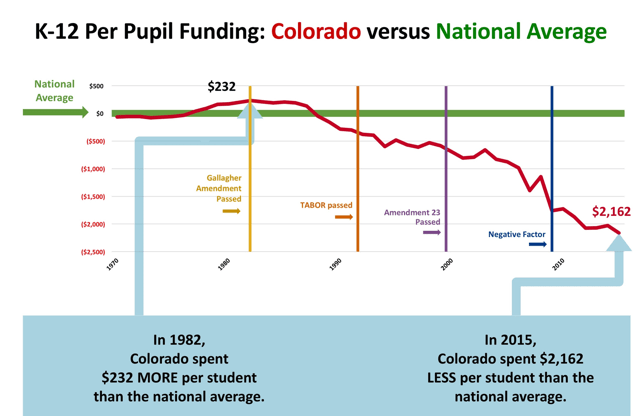 Additionally, due to the Negative Factor (accurately renamed the BS Factor by our legislators), our schools have been defunded by over $7 Billion in Colorado. Still, in recent online social media discussions, far too many individuals still don’t understand the dire situation of school funding. Despite links and facts, so many choose ignorance and continue to argue that marijuana should be funding our schools or that districts need to learn to better manage their money and balance a budget. Imagine writing a check for $50 to pay for your rent or mortgage, though you agreed to pay $1000 a month. What might be the reaction of your lender or landlord? What might you feel if you went to work every day, did your job well, and your company decided they just felt like paying you $100 per month instead of the $2000 per month you agreed to and were due for your time? The truth is, there is over $1.2 Billion in deferred maintenance needed at our schools in Jeffco, with no way of funding the deficiencies without taxpayers approving a bond. The average age of our buildings is 50 years old. Because Jeffco is one of the oldest districts in the state, we have several buildings that are much older. Several grandparents in our community will tell you that they graduated from and attended school in many of the existing buildings in our district. Listen to one of our Jeffco principals talk about his building, Jefferson High School, which is one of the oldest buildings in the district. Though our amazing facility employees do all they can to maintain our buildings with limited resources (just like any prideful homeowner), the inequities being created due to the funding deficiencies are also detrimental to student learning conditions. Imagine having bats in your home and skunks living under it. When it rains, imagine that it also rains inside your home because your roofing is due for a replacement. Now imagine that your partner tells you that you’re not allowed to fix it. Schools and our communities are very much partners. Schools impact our property values as well as attract new businesses wishing to relocate or invest in communities. When the community chooses not to thoughtfully and continually invest in the assets of the community that make living in Jeffco so rewarding, new businesses stay away and leave, resulting in an increased loss of revenue that sustains the vibrancy of the community. Similar to our roads and public infrastructure, the potholes get bigger when investments are not made to renew and restore the community owned assets. If you have a car for just 10 years, over that duration, you need to fill it with gas to keep it operating. Beyond that, you need oil changes, new tires, window repairs, and regular maintenance. If you don’t perform this regular maintenance, more problems develop over time and the repairs become increasingly more expensive. Once you open the walls of buildings and learn more about the facilities we keep our educators and children in each day, you see the issues in depth. Electrical issues, technology issues, HVAC and other mechanical issues, structural issues, etc.. Jeffco Schools has been extremely transparent over the years about the needs. It really is time for the community to come together to take care of our mutual investments and demand upkeep, demand the schools that our children deserve. We need to support our schools and public education for all. Step 1 for action is to get Great Schools, Thriving Communities on the ballot this November and then tell everyone you know about it as well as ensuring they vote for it. The future of Colorado depends on us working together to make this a reality!